Courses for all levels of ability. Whether you are first starting out on KashFlow, or if you are a seasoned user, you will find value in our tailored courses. Courses are split into level 1,2 and 3 for new users and bitesized courses for existing users who want to supplement their knowledge, or want to learn about a new feature. Purchase and sign up to our next available courses below. Courses are scheduled for specific times; webinars are transmitted live and you will have the opportunity to ask questions, classroom courses are delivered in our training centre in London Liverpool Street. Searching for an immediate solution to your learning needs? 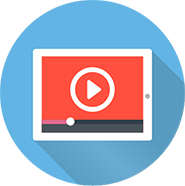 Look no further, there are a host of short free and paid for e-learning videos for you to purchase. Go directly to the information you need, straight away.